The complexion (chavivanna) is the colour and condition of the facial skin and the countenance (mukha) is the expression on the face. Complexion is one of the five types of human beauty; the others being beautiful hair, muscle structure, teeth and youth (Ja.I,394). In ancient India a complexion which was ‘not too dark and not too fair’ was considered the most desirable (M.I,88). Our complexion is influenced by physical factors like genetics, health, diet and climate. However, our psychological state has some influence on our complexion too and it is the major factor in shaping our countenance. The numerous muscles in the face are unique in that they are attached to the facial skin, surrounding and radiating from the eyes, mouth, nose and ears. Our emotions make these muscles expand or contract which influences blo od flow to the skin and thus skin colour. Emotions that have become habitual can cause some muscles to be permanently tight or loose changing the contours of the face so that the skin becomes smooth or wrinkled. Popular wisdom says that a person's heart is written on their face and there is an element of truth in this saying. Fear or worry can make the eyes to sink into their sockets, the cheeks droop and the skin become pale. An explosive temper can make the face red and in time cause the capillaries to become visible (dhamanisanthtagatta) so that the skin has a blotchy appearance. A persistently angry, critical or haughty outlook can give the skin a dark hue and make the ends of the mouth turn down into a sneer. 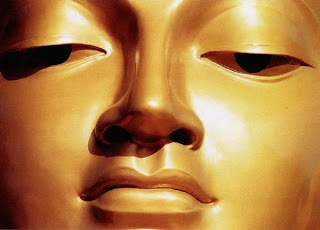 In numerous places throughout the scriptures the Buddha is described as having a golden-coloured skin (kancanasannibhattaca), exceptionally smooth skin (sukhumacchavi) and clear and radiant faculties (vippasannani indriyani, A.I,181; D.III,143; Sn.551). This outer beauty was a direct result of his inner transformation. The experience of enlightenment had dissolved all greed, hatred and perplexity creating space for the unrestricted expression of love, kindness, detachment and clarity. This in turn gave the Buddha a beautiful complexion and countenance that lasted even into his old age. A sure sign of progress in meditation is that the face develops a more noticeably calm and pleasant demeanour (bhadramukha). Those who are able to spend longer periods in meditation and whose practice is fruitful, are sometimes reported as having radiant complexions. This is particularly true for those doing loving-kindness meditation or who have attained any of the four jhanas (S.III,236; V,301).